Ye Olde Rocket Forum - Merry Christmas!! All I got was a half gallon of Captain Morgan for Christmas. No rocket stuff. We still have a half dozen rockets that have never been launched. Seems that when we have the time to go launch, there are 20 mph winds. YUP! Wind is the bane of us rocketeers in Illinois. 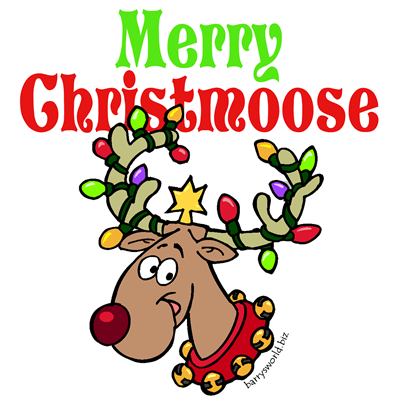 I'm sorry, but even as a caricature it looks more like a reindeer than a moose. "The Vixen" and I gave gifts only to each other this year. I got her a canister of Shalimar body powder and a Dooney and Bourke purse. She got me these (2) books. The photos and techinical drawings in them are AWESOME!! By the way, I’m envious of those books! Very nice. It does have talc, but she doesn’t use it “there”. Merry Belated Christmas and a Happy New Year to all and to all a good night.